GARY ANDERSON crashed out of the Ladbrokes World Series of Darts Finals to Joe Cullen at Glasgow's Braehead Arena on Saturday night, as Michael van Gerwen and Phil Taylor avoided potential upsets. World Champion Anderson was knocked out in a deciding leg by Terry Jenkins in his opener in Glasgow a year ago, and suffered the same fate as Cullen continued his impressive 2016 by holding his nerve against the Scottish favourite. Anderson had won the World Series events in Dubai, Auckland and Tokyo earlier this year, but was unable to mark his first appearance on stage wearing glasses - and using a new design of dart - with victory. The Scot started brightly enough in front of the passionate Scottish crowd as he opened up a 2-0 lead with legs of 15 and 13 darts, but Cullen levelled before finishing 124 on the bull to move himself ahead. 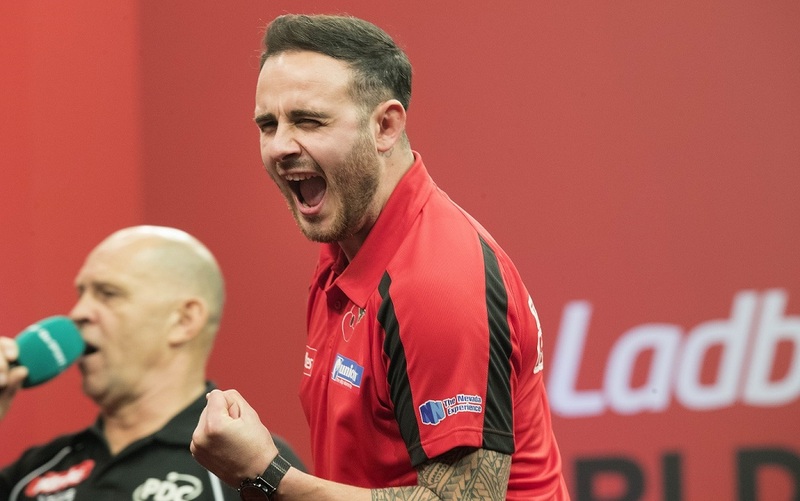 The next five legs were won with throw to send the contest into a decider, which Cullen took with a 13-dart finish of his own as he moved into the quarter-finals of a televised event for only the second time in his career. "It's brilliant," said Cullen, who had edged out Joe Murnan 6-5 in the first round earlier in the day. "It's great to beat the World Champion in Scotland - it was a great atmosphere, up there with the best I've played in front of." Cullen will now play Peter Wright, after last year's runner-up in this event impressed in his 6-3 win over Daryl Gurney in their second round clash. Northern Ireland's Gurney had defeated youngster Josh Payne by the same scoreline in the afternoon session, taking out a key 141 finish, but found Wright too strong as the world number five backed up his firework-themed outfit with a strong display. World number one van Gerwen, the champion in both Shanghai and Perth, held off Gerwyn Price's fightback to claim a narrow 6-5 win over the Welshman, who had defeated Steve Beaton 6-3 in round one. Van Gerwen - last week's European Championship winner - led 3-0 and 5-2 before Price battled back to level, but the Dutchman was first to a finish in the decider as a 13-darter secured his triumph. "I did enough to win the game," said van Gerwen. "Gerwyn tried everything he could to make it as close as possible but I out-scored him. The win was the most important thing and I'm through to the quarter-finals. I'm feeling confident and playing well and I'll get myself ready because it's a big day." Van Gerwen now takes on Simon Whitlock in the last eight, after the Australian defeated Brendan Dolan 6-5 and Raymond van Barneveld 6-2 during a super Saturday at the Braehead Arena. 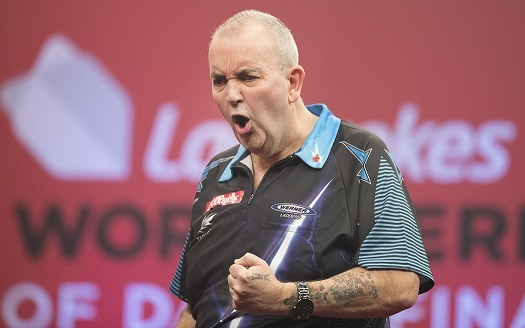 Phil Taylor came from three legs down to avenge last week's defeat to Mensur Suljovic in the European Championship quarter-finals with a 6-3 win over the Austrian. Suljovic - who went on to reach the European Championship final - had been in brilliant form as he whitewashed Robert Thornton in the first round, taking out finishes of 120 and 116 as he punished ten missed doubles from the Scot, and started superbly on his return to the stage against Taylor by taking the first three legs. Taylor, though, sparked his revival with a 12-darter and also landed an 11-dart finish as he took five successive legs before finishing 120 to complete a fine comeback. 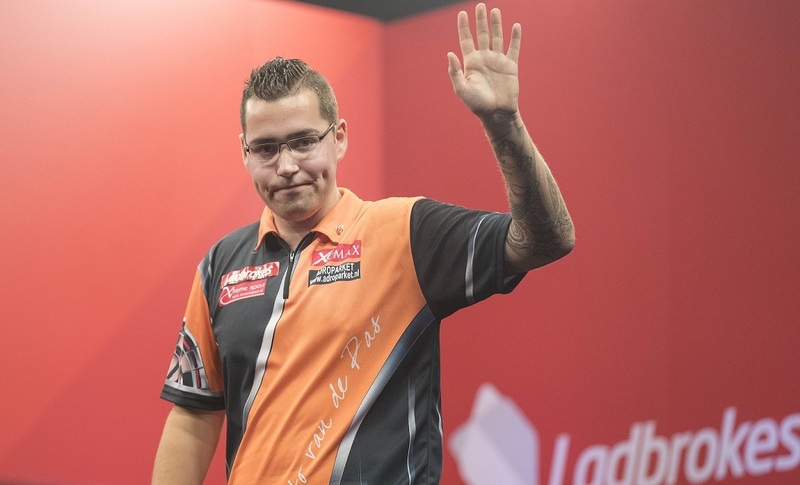 Taylor now meets Dutch youngster Benito van de Pas, who followed up his first round win over former World Youth Champion Michael Smith with a defeat of James Wade on Saturday night. Wade - a semi-finalist in last week's European Championship - led 3-1 and 5-3 but paid for failing to close out victory as van de Pas hit back to force a deciding leg with a 12-darter before posting double eight to edge through. Two-time World Champion Adrian Lewis - the runner-up to Anderson in the Auckland Darts Masters in June - came from two legs down to defeat Cristo Reyes 6-3 as he moved into the last four. Reyes had produced a superb fightback himself as he edged out Germany's Max Hopp 6-5 in the first round, and took out a 148 finish as he moved 2-0 up against Lewis. 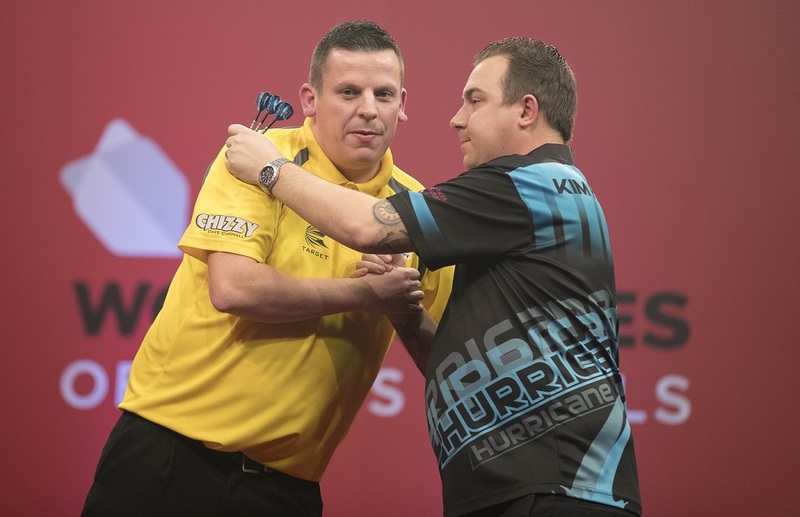 The Stoke ace, though, hit back-to-back 14-darters in a run of four successive legs to move ahead before sealing victory with a 13-dart finish to set up a tasty quarter-final against Dave Chisnall. Chisnall - August's Perth Darts Masters runner-up - produced a sublime performance to average almost 113 in a fine 6-4 win over Kim Huybrechts, who overcame Jelle Klaasen in the afternoon session Chisnall opened the match with the first of three 11-dart legs and he also landed a ten-darter before hitting a fourth 180 in leg ten as he secured the win.